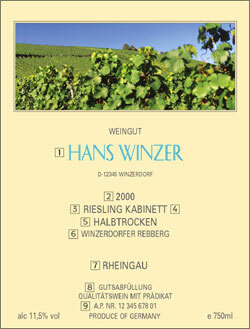 Name of producer or estate, in this case the producer is Winzer Bacchus. The vintage is the year the grapes were harvested. Wine is an agricultural product and consequently very dependent on the weather which in Germany, unlike more southerly climates, can be extremely variable. The grape variety used to make a wine is the single most influential factor determining its taste. Different grapes have different flavors, just like different fruits have different flavors. For example: Riesling is a very fruit-driven grape variety providing a fine acidity. Gewürztraminer has very floral, perfumed flavors reminiscent of rose petals while Silvaner is lower in acidity and less floral, rather plain. The ripeness categories are Deutscher Wein (formerly Tafelwein), Deutscher Landwein, Qualitätswein and Qualitätswein mit Prädikat. The latter is further divided into the ripeness levels Kabinett, Spätlese, Auslese, Beerenauselese, Trockenbeerenauslese and Eiswein. More about that on our Ripeness category page. Dryness levels are not to be confused with ripeness categories which depend on the ripeness of the grapes harvested in the vineyard. Whether a wine is dry or sweet can be indicated on the label. Trocken indicates dry wine without perceptible residual sweetness. It never contains more than 9 grams of residual sugar per liter and often less. It is very dry. Halbtrocken wines are semi-dry and may not have more than 18 grams of residual sugar per liter. With this barely perceptible sweetness, halbtrocken wines are considered “dry” by most wine lovers. If none of the above dryness levels can be found on the label, the wine is most likely a sweeter style wine, but it can range from off-dry to fully sweet. Generally, the sweetness in the wine does correlate with the ripeness levels. The often difficult to pronounce names on the label indicate the village where the vineyard is located (identified by the -er suffix) followed by another name (often ending in -berg [=mountain, slope] indicating the vineyard site. Proprietary names like “Liebfraumilch” and “Bishop of Riesling” have no vineyard designation, they are a blend of wines from several vineyards. To identify the region compare with the following list of the 13 German wine growing regions: Ahr, Mittelrhein, Mosel-Saar-Ruwer, Rheingau, Nahe, Pfalz, Rheinhessen, Franken, Hessische Bergstrasse, Württemberg, Baden, Saale/Unstrut, Sachsen.